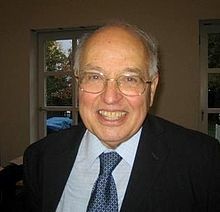 Sir Michael Francis Atiyah OM FRS FRSE FMedSci FREng (/əˈtiːə/; 22 April 1929 – 11 January 2019) was an English mathematician specialising in geometry. He won the Fields Medal in 1966 and the Abel Prize in 2004. He was president of the Royal Society (1990–1995), master of Trinity College, Cambridge (1990–1997), chancellor of the University of Leicester (1995–2005), and president of the Royal Society of Edinburgh (2005–2008). From 1997 until his death, he was an honorary professor at the University of Edinburgh. Atiyah died on 11 January 2019 at the age of 89. ↑ Hitchin, Nigel J. (1972). "Differentiable manifolds : the space of harmonic spinors". bodleian.ox.ac.uk. University of Oxford. OCLC 500473357. EThOS uk.bl.ethos.459281. ↑ O'Connor, John J.; Robertson, Edmund F., "Michael Atiyah", MacTutor History of Mathematics archive, University of St Andrews . This page was last changed on 11 January 2019, at 19:59.